I paid a discount price of $25.99 at a hobby shop in Chicago that was going out of business. The kit has a copyright date of 2000 and I see no listings of this type of kit by Dragon on the net anymore. The non-commissioned officer is considered to be the "backbone" of an army and so it was in the Wehrmacht in WWII. The duties of the NCO were to conduct the daily business of his unit and look after the welfare of his soldiers, thus leaving his commanding officer to accomplish his own duties. It was the responsibility of the NCO to teach, train, coach and counsel his soldiers, assuring that they always met the highest standards of military deportment. Most of all, the NCO was a leader. In the absence of orders, he was to seize the initiative, and take the appropriate action. The NCO had to be unquestionably competent and promotion was based on demonstrated leadership ability and experience. There were three catagories of NCO's in the German Army. 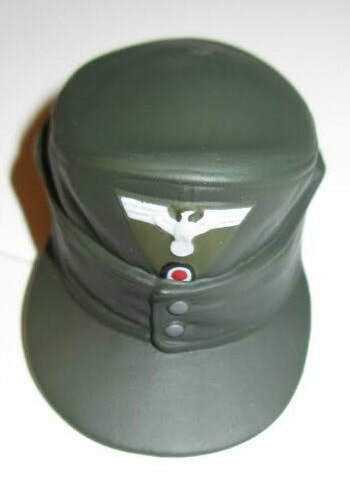 First were the junior NCO's (Unteroffizier ohne Portepee) which included Unteroffizier (Corporal) and Unterfeldwebel (Sergeant) ranks, senior NCO's (Unterofficier mit portepee) include the ranks of Feldwebel (Staff Sergeant), Oberfeldwebel (Technical Sergeant), and Stabsfeldwebel (Master Sergeant), Hauptfeldwebel (der spiess) was an appointment rather than a rank and was perhaps the equivalent of a regimental sergeant major. The third group were Technical NCO's whose purpose was primarily instruction. As the war progressed and losses mounted, an Oberfeldwebel could well have found himself commanding a platoon in combat. In the close quarter desperate battles on the Eastern Front it was common for a soldier to acquire a captured weapon. The PPSH 41 sub-machine gun was a favorite due to its reliability and 71 round magazine. At least one spare drum was carried in a captured canvas pouch. Dragon or DML is a prolific model company based in Hong Kong, China. They manufacture all manner of model subjects in the popular scales. In the case of this kit, at one time Dragon manufactured a series of figures to 1/6th scale..12" tall. These figures were fully dressed in cloth clothing and had all their equipment included and their joints were articulated and move. 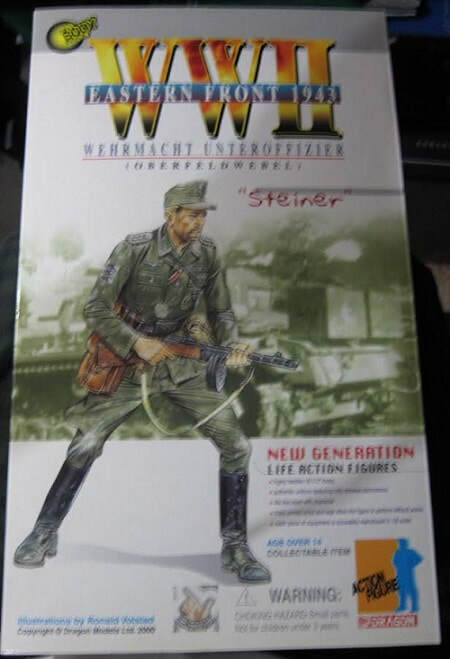 I recently discovered a few of these 1/6th scale figure kits on the Platz site in Japan. The extensive decorations and awards on the M43 field blouse that the figure wears demonstrates that this NCO has seen much action. The Close Combat Clasp worn above his left pocket was considered by many to be the highest infantry decoration. It was awarded in three forms, bronze, silver and gilt for 15, 30, and 50 days of close combat. The wound badge was also awarded in three grades, black for 1 or 2 wounds, silver for 3 or 4 wounds and gilt for 5 or more wounds. The Infantry Assault Badge was awarded for participation in at least three infantry attacks on seperate days. On his left sleeve is the "Krimschild" for armed forces members who took part in the fighting in Crimea, between 21 September 1941 nd 4 July 1943. On his right sleeve are three tank destruction badges that indicated that he had single-handedly destroyed three enemy tanks using light weapons such as mines or the Panzerfaust. When combined with the Iron Cross, First and Second class, an Oberfeldwebel so decorated would have commanded a great deal of respect from his comrades. Certainly his proven experience would have allowed the Oberfeldwebel some lenience in his dress. Unless the NCO had previously been assigned to a mounted unit, the breeches and riding boots would have been definitely "non-standard". Evidence does exist that such indulgences did occur, but shouldn't be considered as common practice. 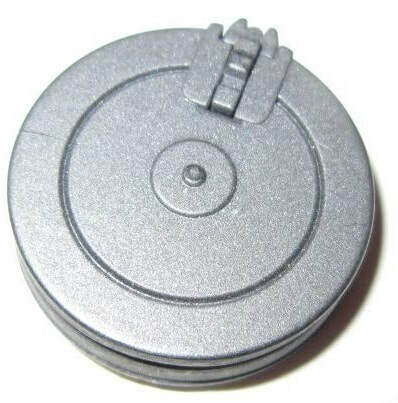 This kit comes in an end opening type box that has seperate hinged lid that is held shut with circles of velcro. The end flaps are held shut with tabs. The box art show a Unteroffizier crouching forward and firing a captured Soviet PPSH submachine gun. He wears a field grey uniform with jodpher pants tucked into black jackboots, a field jacket and a cloth peaked field cap. He has all the decorations talked about above. 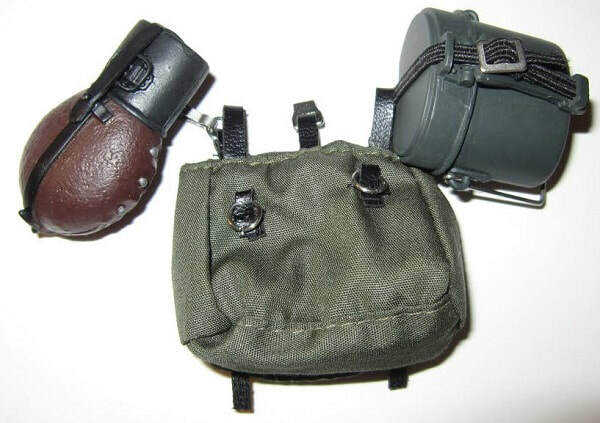 He has a potato masher type grenade tucked under his belt, a canvas ammo drum pouch and a M1935 dispatch case and a M1930/38 gas mask canister also on his belt. Inside the box is a clear tray with recesses in it to hold the figure and his accessories. The lid of the box is clear to see down inside the box. 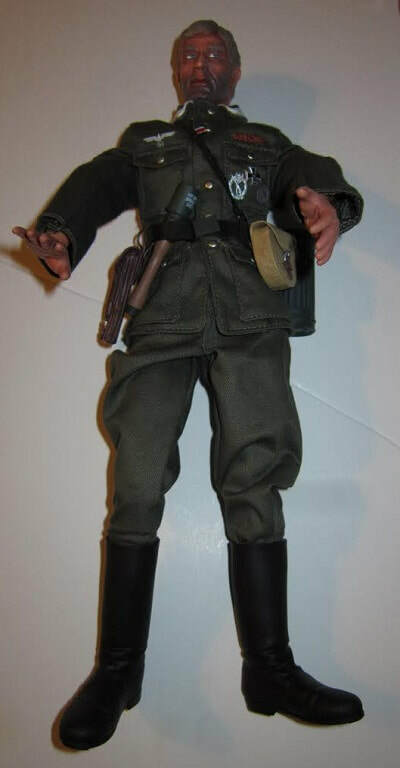 The recesses hold the figure dressed in his uniform, with a dispatch case and ammo case on his belt and a potato masher type grenade tucked under it. His field cap, a captured Soviet PPK machine gun that is hinged to be able to open its breech and has a cloth carrying belt on it. Two ammunition snail drums for the PPK, a mess kit, canteen and cloth sack. ​There is a clear part in the box that was inside a sealed cello bag. At first I didn't know what this was because there are no instructions in the kit. 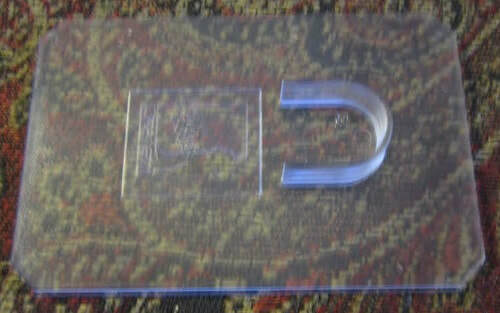 After looking at it a while I figure out that this clear plate with a raised letter "U" on it is a base plate. You press one of the figure's heels into it to stand him up. Both side panels of the box have small color repeats of the box art. ​ Under this on one side panel it says "This product represents a subject from a specific period in history. It contains details, equipment, uniforms and vehicles that include insignia or marking that some may find offensive. All insignia and emblems are included to maintain complete historical accuracy. The inclusion of these insignia and emblem markings in no way an endorsement or approval of the activities associated with the subject matter at any time or manner." The bottom of the box has line drawings of the M1943 tunic (showing it's front and back), the M1935 dispatch case, the M1930/38 gas mask canister, the M1943 field cap and the PPSh 41 ammo pouch. All illustrations are done by Dragon's designated artist Ronald Volstad. Although I don't really play with dolls. This kit was just too neat to pass up years ago. Highly recommended if you can find it or any of the rest of the series of these type of figures that were once offered by Dragon. I see that the PLATZ web site says they have some.